Kids' Book Review: Review: Death or Ice Cream? 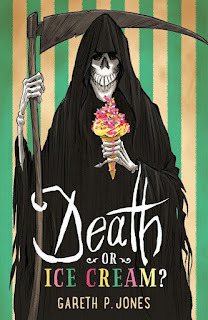 Review: Death or Ice Cream? Larkin Mills is an unusual place. If you live there you seem to have a much higher than normal chance of dying in quite extraordinary circumstances. On the other hand, you're also able to enjoy possibly the best ice cream in the world, made by Mr Morricone and available in such delectable flavours as Summer Fruits Suicide and Christmas Massacre. For a bit of light entertainment, you can visit the steam fair, which runs on electricity supplied by eels. If you're a visitor and need a place to stay, the funeral parlour doubles as the town's only hotel. But whatever you do, if you meet someone carrying a large smooth egg, don't touch it. Each chapter in this crazily inventive book is a self-contained snapshot of life (or, more often, death) in the town of Larkin Mills, narrated by one of the residents. Characters often appear in more than one chapter. Stories intertwine. And as the book progresses, there are enough clues for the astute reader to unravel the dark mystery that lies at the heart of the town. The sheer inventiveness of Gareth P. Jones' writing is astounding. I think my favourite scenario is the suburban house filled with water and sharks — all part of a project by the town council's Department of Planning to plan for 'eventualities' — but there are several other chapters that run it close. It's a mind-bending read that's often very funny. However, it's also a thought-provoking book. Underlying each chapter are questions that go to the very heart of what it means to be human and how we choose to live our lives. Matters of life, death … and ice cream! Title: Death or Ice Cream?